As you’ll see below we have already spoken about the 2017 Kia Rio, but we now have confirmation of what this car is bringing to the market. We thought we would take some time to update this post to give you the full details on your potential next new supermini from Kia. Take 5 minutes to read the below, and you won’t be disappointed with the Rio! The Rio will be officially in the UK in February 2017, just in time for the new reg launch in March, but the car will only be arriving with 5 doors attached. The 3 door version has been ditched by the UK automotive industry due to lack of demand for fewer doors. You’ll be also pleased to know that Kia will be releasing a GT Line model, this will have different wheels and body trim. There’s no second-best or transplanting other models engine into this new car. The South Korean manufacturer has developed a brand new 3-cylinder 1.0litre, turbocharged power unit. This will come with a punchy 99bhp or 118bhp that both offer 127lb ft of torque. We can’t yet tell you what economy or C02 figures these engines will generate, as Kia still hasn’t confirmed them yet, but we can tell you it's expected to come in under 100g/km. The gearbox will be manual only with a 5-speed gearbox on the 1.25 and 1.0 petrol engine and a 6-speed gearbox on all other power unit configurations. As we mentioned above the interior of the Rio has become more spacious. This is due to the increase in wheelbase by 10mm and an increase of 15mm in overall length. This doesn’t sound a lot but it offers a noticeable difference within the interior. These gains have produced a boot space of 325litres compared to the previous model at 288litres. The new luggage space beats the Kia rivals such as the Ford Fiesta, Vauxhall Corsa and the VW Polo. Due to the new supermini's handling and ride changes, it's created a lower stance than previous the model’s. This is due to upgrades to the suspension offering a more rigid setup. This intern with a stiffer chassis offers handling on a par with the Fiesta with the comfort of a Polo. The car manufacturer has also upgraded the Rio’s safety equipment, as they are aiming to achieve a 5star Euro NCAP safety rating. There will be safety elements such as autonomous emergency braking and the body is made from a high-strength steel. We don’t have any information on the price currently as this will be announced nearer the launch date. However, if you're interested in the 2017 Kia Rio contact one of our Kia representatives to arrange a test drive as soon as it hits our dealership. With lots of new designs entering the automotive market, it looks like 2017 is going to be the year of the supermini! 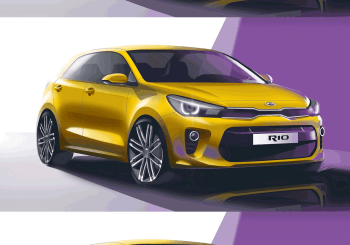 With this in mind, Kia is launching the all-new fourth generation Kia Rio which is going to be a strong competitor against popular rivals like the VW Polo and Ford Fiesta. Below are the first official design sketches, which give us a glimpse of the models new sleek, sharp makeover. These images come ahead of its debut, which is taking place at the 2016 Paris Motor Show on the 29th of September. The new model will go into production at the end of 2016, but it’s not 100% clear yet on when it will arrive in the UK. Prices for the new car are expected to be around the £11,000 mark, similar to the prices of the current model. The Rio is Kia’s top-selling model, with more than 473,000 being built in 2015 alone. Because of these figures, the South Korean car manufacturer have put a huge amount of groundwork into tweaking the replacement 4th model. The new design has had input from Germany, Korea and California to make sure it appeals to consumers across the globe. From these official images released from Kia, we can see that the new model has received a sporty makeover, featuring a lower and wider stance. This is because of the ‘Tiger Nose’ grille that stretches out into the headlights. These lights have been made slimmer and now angle downwards using a unique light signature. These sketch photos also confirm that it has a longer wheelbase providing more interior room, and the lower grille and bonnet appear to be much larger than before. What will the 2017 Rio bring? We look forward to seeing the Rio debut next month at the Paris Motor Show and will provide an update when more info is released on this supermini.